Microsoft released updates for Office 2013 and Office 2016 on yesterday's Office non-security Patch Day. The company releases non-security updates for Microsoft Office on the first Tuesday of the month; security updates follow a week later on Patch Tuesday, the second Tuesday of the month. Microsoft released updates for Office 2013 and 2016 only; the company released no updates for the still-supported Office 2010 or the no-longer-supported Office 2007. Start any Office application on the machine. Office Click-to-Run installations display About and Office Updates, MSI-based Office installations only About on the screen. Microsoft released four non-security updates for Office 2013 on the June 2018 Patch Day. KB3178712 -- June 5, 2018, update for OneDrive for Business for Office 2013 -- The update adds capabilities to OneDrive to take over the sync relationships of OneDrive for Business (groove.exe). KB4022171 -- June 5, 2018, update for Project 2013 -- The patch fixes a crash issue in Project 2013 when deleting Gannt chart type views that have drawings, a related issue that may delete drawings from other views, and fixes the error message "Sorry, we were unable to open your project. Please try again. Is this happens again, contact your administrator" when trying to open enterprise calendars when connected to a Project Web App instance by using Chrome. KB4022186 -- June 5, 2018, update for Word 2013 -- The update fixes a crash issue when loading legacy .doc files in Word 2013 and an indent issue when copying table cells from one row to another in Draft view. A total of 10 updates were released for Office 2016 as part of the June 2018 Patch Day. KB4022156 -- June 5, 2018, update for Office 2016 -- The update reduces latency and consumption for Microsoft Dynamics CRM add-ins, and adds support for the Dollar symbol as a supported delimiter to replace the pipe symbol in the UI.displayDialogAsync method. KB4022158 -- June 5, 2018, update for Office 2016 -- Adds support for the value DisallowWinCredsToBePersisted under the Registry key HKEY_CURRENT_USER\Software\Microsoft\Office\16.0\Common\Identity. Set it to 1 to not allow Security Support Provider Interface (SSPI) credentials to be persisted in Credentials Manager. Lines drawn with pixel-wide pens were drawn thicker as intended sometimes when exporting documents to PDF. Restore not working properly when trying to restore a file to an earlier version using version history in OneDrive or SharePoint Server. Fixes the error "There was a problem getting version history". Improves Russian and Swedish translations in Outlook 2016. Improves the Danish translation in Excel 2016. And Registry key support as detailed in KB4022158. KB4022193 -- June 5, 2018, update for Office 2016 -- Enables the display of math equations created with Microsoft Equation Editor 3.0 which is no longer supported. KB4018370 -- June 5, 2018, update for Office 2016 Language Interface Pack -- Improves translation about "forwarding a meeting" in Outlook 2016 for all languages. 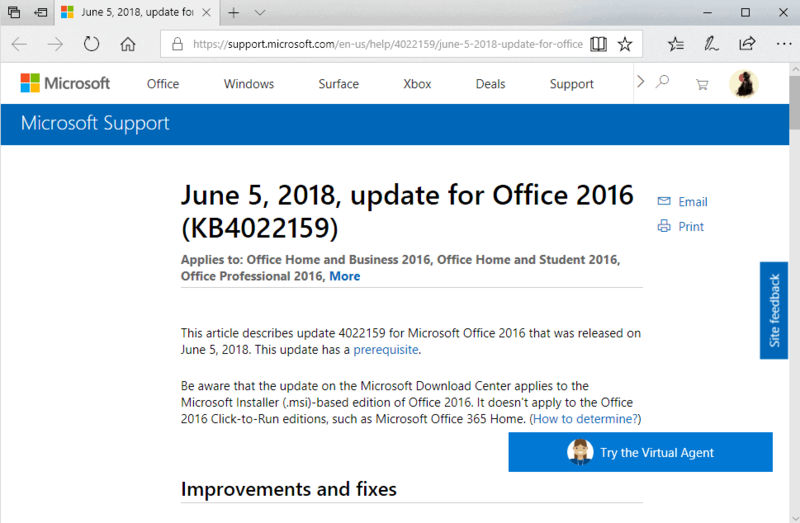 KB4011100 --June 5, 2018, update for OneDrive for Business for Office 2016 -- same as KB3178712 for Office 2013. Display of second authentication prompt after using Pin-based authentication. Fonts become YuGothic after changing the default font to other DBCS fonts. Audio and video recording does not work as expected. OneNote 2016 crash when opening, editing, or closing multiple embedded files. Fixes cause of the error message "These tasks can't be linked because they're already linked through another task chain". Assignment values showing 100% instead of 0%. Large database when saving projects created by Project 2002 or Project 2003. Remaining cost is lost issue when splitting tasks. Crash in Project 2016 when Project-based COM add-in executes FileSave method. Fixes cause of the error "Sorry, we were unable to open your project. Please try again. If this happens again, contact your administrator". Booking type is reversed from Committed to Proposed under certain circumstances. Gantt chart type view related crash. There is no direct need to install any of the updates unless you are affected by the issues that they resolve. 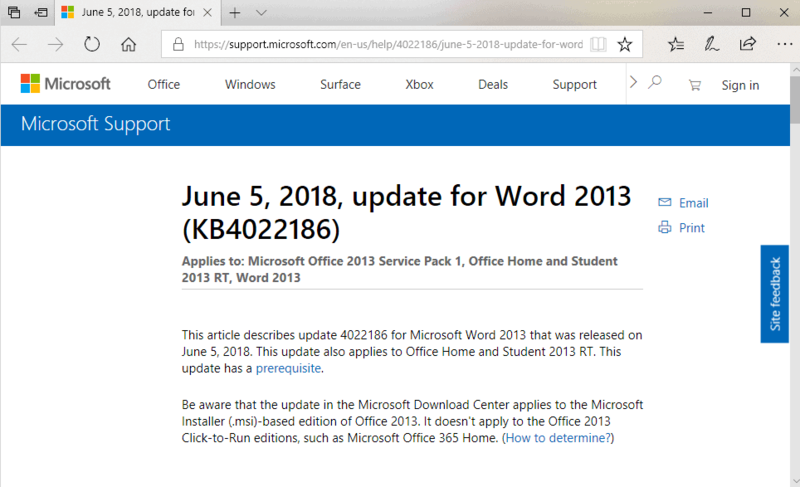 Microsoft released updates for Office 2013 and Office 2016 on yesterday's June 2018 Microsoft Office non-security Patch Day. you are providing me every month with, true your update articles. Please keep it up this because it has become a really steady rock for me. Microsoft Office is a family of client software, server software, and services developed by Microsoft.Thanks for sharing us . But is there not a case for applying these updates to forestall the possibility they might be needed? As long as they do not diminish the security or functionality of the software? And indeed, to improve the functionality of the software at some level? I believe most experienced yet not expert users would benefit from a clearer statement of the situation. The general consensus is that you should not install updates that Microsoft pushes out right away unless you a) have backup b) are affected by one of the issues, c) benefit from new functionality, or d) it is a security update. Updates may introduce new functionality but that is rather rare; more often than not, they are simple fixes. Problem is, these updates may destabilize your operating system or software, and the past has shown that this happens frequently now.